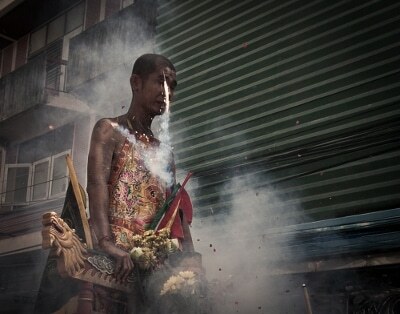 PHUKET: With 70 people injured and one person dying from complications brought on by smoke inhalation during the Vegetarian Festival last year, the Phuket Health Office is calling for more stringent measures to protect celebrants from harm this year. Phuket Provincial Health Office (PPHO) chief Dr Sak Tanchaikul called the heads of Chinese shrines taking part in the this year’s festival together on Tuesday to urge them to send the message to their devotees and spirit medium (mah song) carers to step up safety during their festivities. “This year the festival will be on October 15-23 and a lot of tourists will come to the island to see the various spirit mediums in the festival. During these activities, the mah song walk barefoot over hot coals, climb bladed ladders, and during the street processions people light firecrackers,” Dr Sak said. “Last year, many people were injured during the festival: 29 people were injured from performing with weapons and 41 people were injured from firecrackers, smoke and noise, of which 14 suffered injuries to the eyes and 25 people hurt their arms and legs. “Two people suffocated from smoke inhalation; one of those two people later died,” he added. Dr Sak pointed out that noise was becoming a major concern, with the average firecrackers celebration at the shrines reaching 122.6 decibels. “Jui Tui Shrine was the loudest, reaching 135dB,” he explained. “About 3,000 firecrackers were used in about 15 seconds,” he added.